Finding a study environment that works for you can improve your focus and make you more productive. Some people prefer ambient sound while others prize total silence. Some want to be in a communal area and others crave solitude. Do you know what works best for you? 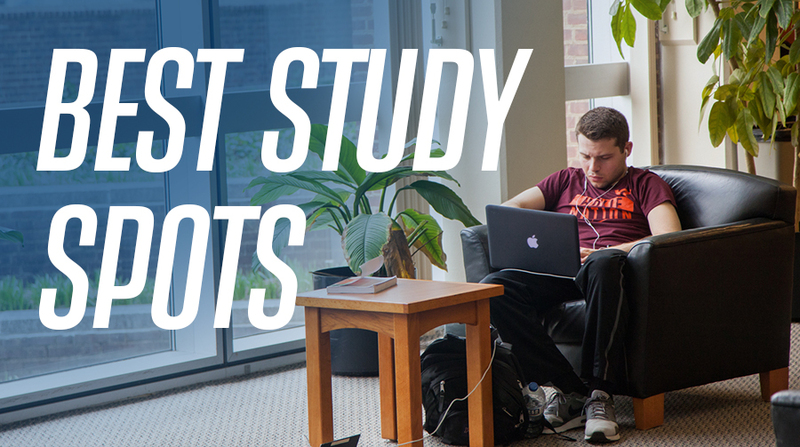 Explore some of the student-favorite study spots throughout Morris Library to discover which areas fit your needs. The name says it all. 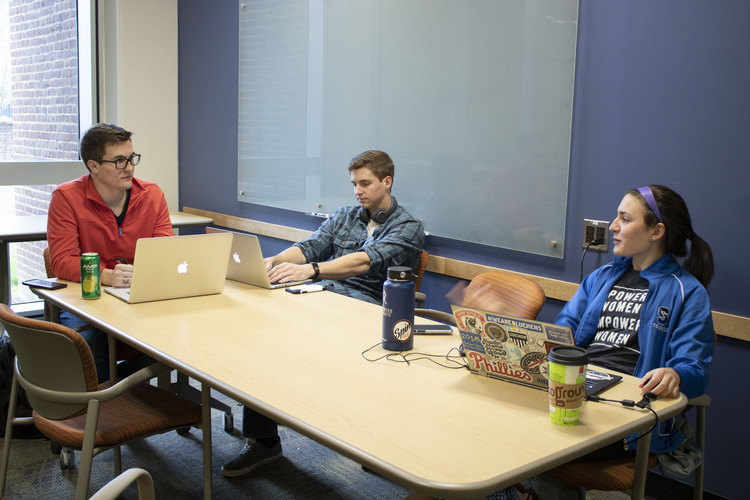 Whether you’re studying for an exam, doing a presentation run-through or working on a group project, sometimes you need space to collaborate with classmates. Inside each study room, you’ll find a table, chairs and a glass board for brainstorming. There are more than 35 group study rooms throughout the four levels of Morris Library, but that doesn’t mean we don’t have our favorites. For those who work best with people around and activity nearby, try the centrally located Lewis Study Room (115T) on the first floor. If you prefer privacy and fewer distractions, book one of the study rooms tucked away on the second and third floors. Reserve a room a week in advance for your group here. Heads up, they fill up fast. Study Tip: Check out the GroupLink tables on the lower level for more group-centric options. There, you can connect multiple computers to the same screen for easy back-and-forth collaboration. Do you prefer a quiet study space with a view? If natural light and windows keep you motivated, head up to the third floor and look for the tall windows, comfortable blue chairs and palm trees. Yes, palm trees. There, you will find the perfect study spot looking out onto South College Ave.
Alongside the blue chairs, you’ll find small tables, perfect for setting down books and notes for a study session. If you need more space to spread out, there are larger tables right behind the soft seating with just as good a view. 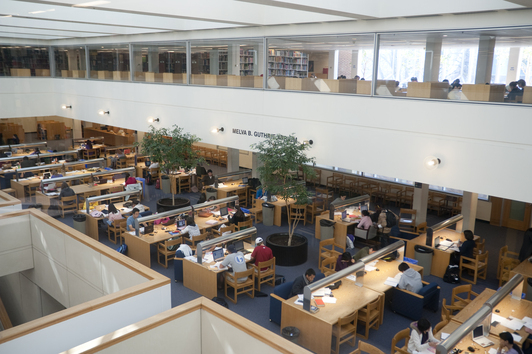 Study Tip: If the third floor soft seating is too crowded, head down to the soft seating area on the first floor in the Reference Room. Whether you grab one of the comfortable black chairs, a spot at a nearby computer or a quiet table near the stacks, the natural light will reach you. When you really need to concentrate on your work, turn to this designated quiet area. 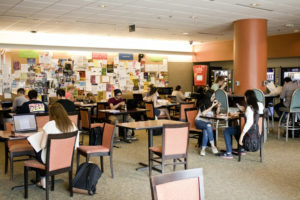 The open room, just down the hallway from the Reference Desk, has a variety of workspace options for you to choose from. You can set out your study materials on a table or create your own study space with the moveable soft chairs. 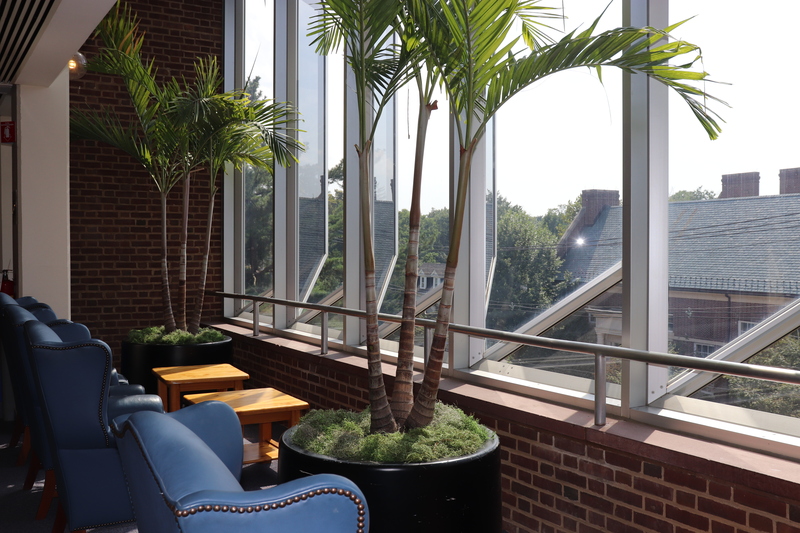 Take one of the more comfortable seats near the windows to enjoy one of the best views the Library has to offer. From your spot, you can watch the changing of classes, the campus foliage and maybe even some squirrels at play. 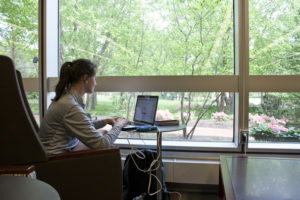 Study Tip: While the Reading Room is quiet, graduate students may find themselves craving more privacy as they work on their research. When that’s the case, they can use their UD ONEcard to swipe into the room in the front corner—the Graduate Student Research Room, complete with spacious workspaces, interesting art and plenty of comfortable seating. When your project requires a creative component, head downstairs to the Student Multimedia Design Center on the lower level. There, you’ll have access to innovative and technological tools, including specialty programs like those in the Adobe Creative Cloud. You’ll find Mac and Windows computers in the general SMDC area, as well as two rooms, which are open for general use when no class is scheduled. If you’re creating a video or audio project, reserve one of the specialty studios to create the highest-quality work. 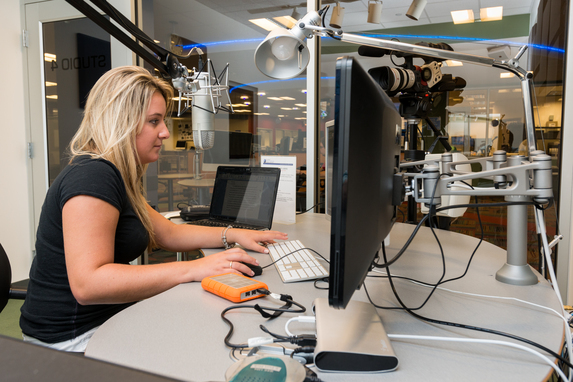 Study Tip: The folks behind the Student Multimedia Design Center desk are there to help you. If you have a question about specific software or need help bringing your idea to life, don’t hesitate to ask them for assistance. With plenty of open seating and natural light from the skylights above, the Atrium on the second floor is a popular study space no matter what part of the semester it is. With tables in close proximity to one another, it’s the perfect fit for those who prefer to study in a communal setting. Between the mood-setting skylights overhead, the ambient noise and the quiet discussions, you can get down to business without feeling isolated. Study Tip: Don’t put extra strain on your eyes by working in the dark. At each table, you’ll find an overhead light, perfect for late night study sessions after the sun goes down or overcast days. If you get bored of the same view, settle in at a different study carrel each time. 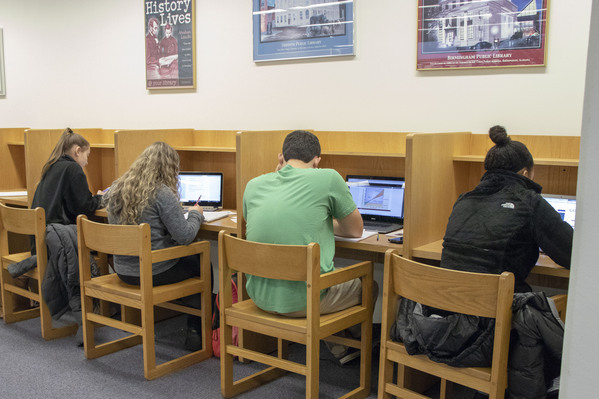 With so many carrels throughout the Library, you can discover new locations and explore which area of the Library you work best in. One day, use a carrel on the third floor that lines the Atrium windows, and the next, find a carrel tucked back in the stacks on the lower level. 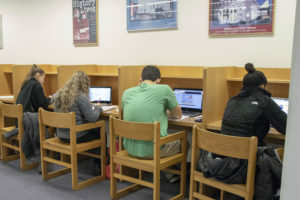 In addition to a change of scenery, study carrels—desks with high sides—help keep out any unwanted distractions and keep your mind focused on your work. Study Tip: The dark brown study carrels down the row from the Third Floor Soft Seating are the newest to the Library. They come with built-in outlets, so you’ll always stay charged, and cushioned seats in case you have a long night ahead of you. During the semester, Morris Library is open pretty late—until 2 a.m. most days, and 10 p.m. on Fridays and Saturdays. It switches into 24-hour mode during finals, but if you find yourself pulling a late-late-late night to crank out a paper or prepare for an exam earlier in the semester, head to the Library Commons. To your immediate right when you enter Morris Library, the Commons is open 24 hours year-round and the perfect place to escape when you need to work and your roommate needs to sleep. Study Tip: Make sure you have change and your UD ONEcard with you. Inside the Commons, you’ll finding vending machines to keep your energy levels high throughout the night. If you find yourself in the Commons in the daylight, treat yourself to a soup or sandwich from Bleecker Street, the café. Why We Love Banned Books..